Can Protein Shakes Cause Acne? Perhaps. Specifically, the Calories in Protein Shakes May Increase Acne. The strongest evidence we have at our disposal that could potentially link protein shakes with acne focus not on the protein itself in protein shakes, but on calories as a whole. Several studies have shown that a high-calorie diet can increase the amounts of the hormones insulin and IGF-1 in the blood, which could then hypothetically lead to acne. Since people often use protein shakes to "bulk up," this means protein shakes often go hand-in-hand with an increase in calories. 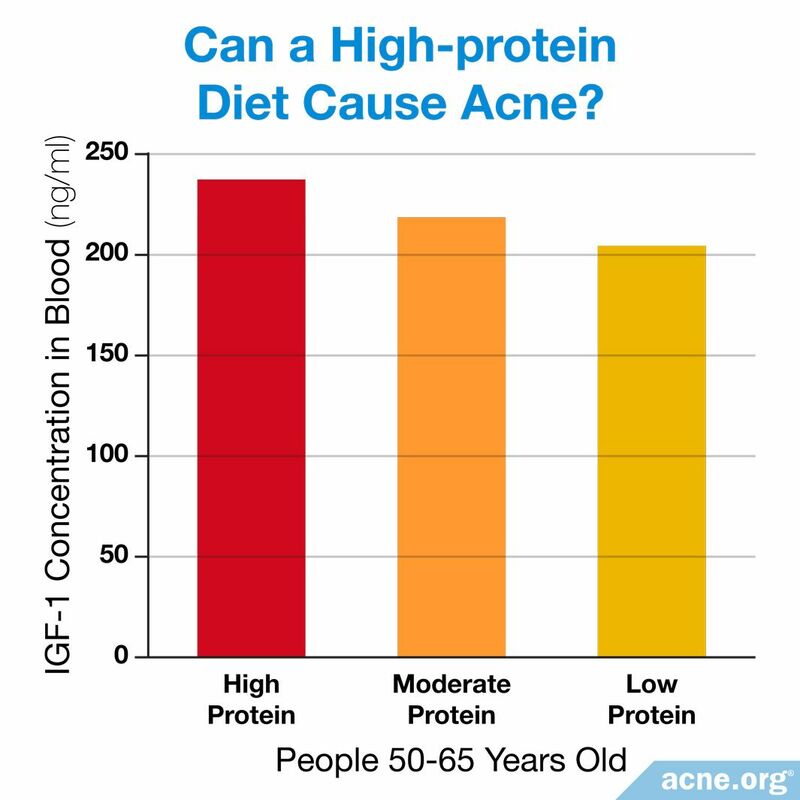 When it comes to protein itself, a few studies have shown us that when protein intake increases, IGF-1 may also increase, which could then hypothetically lead to a worsening of acne. However, more direct evidence would be needed before we draw this conclusion, and it is not yet time to vilify protein as something that leads to acne. Drilling down even further, studies that have looked specifically at the milk proteins called whey protein and casein protein, which are often found in protein shakes, have not been able to conclude that eating these particular types of protein worsen acne. The Bottom Line: If you are breaking out and have recently started "bulking up" with protein shakes, it is more likely that the increased calories you are intaking might be leading to acne than the protein shakes themselves. The following image presents ways that protein shakes might contribute to acne. They keyword here is "might," because none of these things are proven. Generally speaking, all things in moderation is a good rule of thumb. If you are breaking out and have recently started drinking lots of protein shakes, you may want to cut back a bit. But don't stress out about it too much. Athletes following an intense gym schedule, especially those who are trying to "bulk" or gain muscle mass, often consume protein shakes. There are several possible ways in which protein shakes might contribute to acne. Let's look at each of these three possibilities and weigh the evidence, starting with the most logical explanation for why protein shakes might contribute to acne--an increase in calories in the diet. Fair warning: This is going to start getting into some deep science. If you're looking for the short answer to whether protein shakes cause acne, the answer is probably not to any measurable degree by themselves, and you shouldn't be afraid to have a protein shake from time to time. 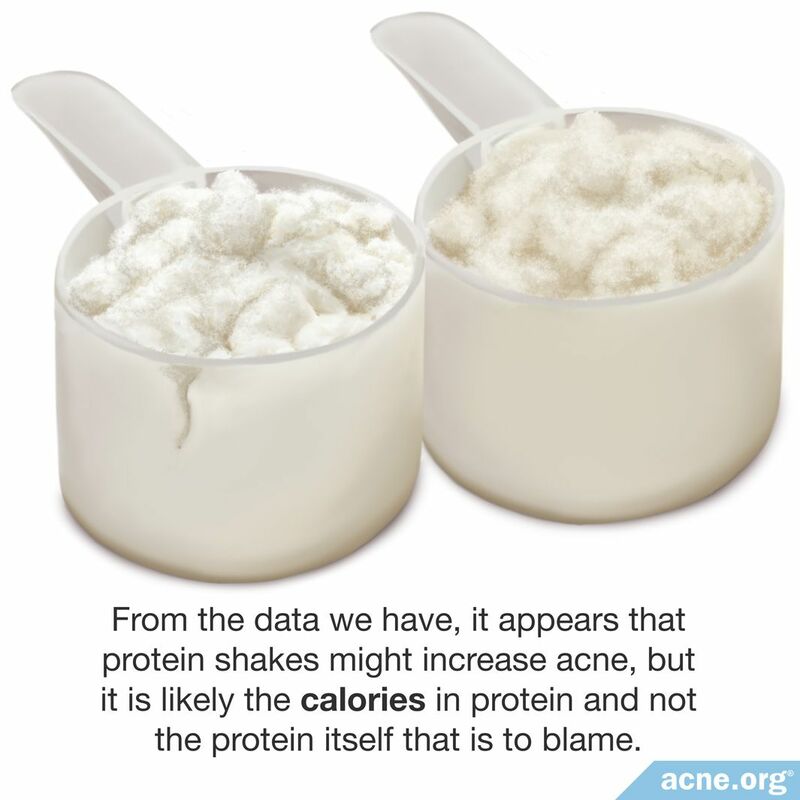 It is more likely that it is the calories in protein shakes that might lead to more acne, and not the protein itself. Can a High-calorie Diet Cause Acne? It is possible to consume protein shakes and still maintain a low-calorie diet. However, people who want to gain muscle mass must take in more calories than the body would need to maintain its current amount of muscle. Therefore, most people who drink protein shakes in order to build muscle typically consume an excess of calories. In other words, protein shakes often go hand-in-hand with a high-calorie diet. 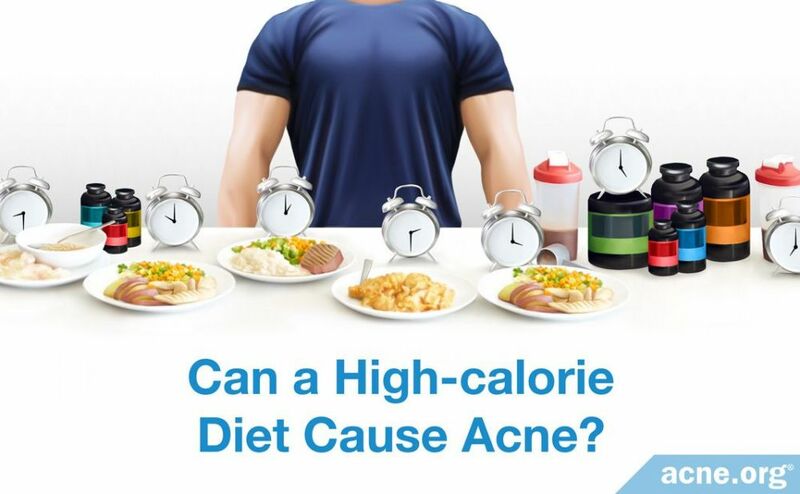 So how might a high-calorie diet lead to more acne? It comes down to hormones. We delved deep into the research and found two experiments that have tested how a low-calorie diet changes the hormones in a person's body. From this information, we can infer that a high-calorie diet would have the opposite effect. 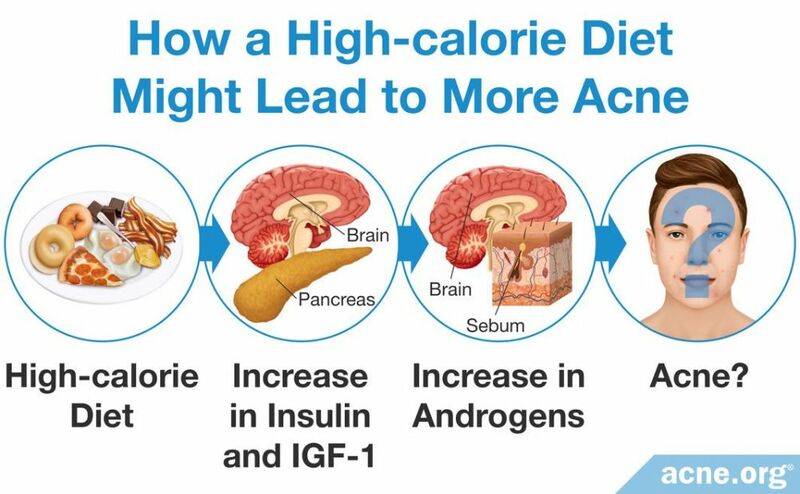 These studies show us that the levels of two hormones in the body, insulin and IGF-1, decrease on a low-calorie diet, so the opposite is likely true on a high-calorie diet. A low-calorie diet decreases the amount of the hormone insulin. The first study, which was published in 2011 in the journal Obesity, was conducted on 13 healthy adults: 12 men and 1 woman. Each person embarked on three different diets. Our inference: From these results, we can infer that if a person consumes a high-calorie diet, the amount of insulin in his blood will increase significantly for some period of time after each meal. Our inference: From this, we can deduce that a high-calorie diet would considerably increase the amount of freely usable IGF-1 in the blood for a duration of time. So if we assume a high calorie diet can potentially increase levels of insulin and IGF-1 in the blood, how might that affect acne? For this, the answer is more straightforward. An increase in insulin and/or IGF-1 can lead to an increase in androgens (male hormones found in both males and females), and androgens are well known to lead to more acne in both males and females. Since people who consume protein shakes often add the shakes to their usual diet, their total calorie intake may increase, and this hormonal cascade, and increased acne, may follow. The following two recent articles published in 2016 show us that a rise in insulin and IGF-1 may worsen acne. But what about the protein itself? Can increasing the amount of protein in the diet, independent of increased calories, also lead to more acne? Let's have a look at that next. 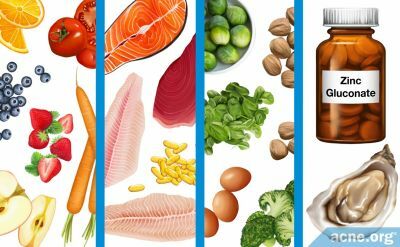 Can a High-protein Diet Cause Acne? In addition to being high in calories, protein shakes are, obviously, high in protein. One study published in 2014 in the journal Metabolism investigated how the amount of protein a person ingests affects hormone levels, and found that the more protein a person consumed, the more IGF-1 was in their blood. As we have already seen, an increase in IGF-1 may potentially lead to an increase in androgens, and in turn, more acne. The study looked at 6381 seniors between the ages of 50 and 65 years. The seniors were chosen to be representative of the U.S. population in terms of ethnicity, education, and health characteristics. Each senior consumed the same number of calories but was assigned to one of three groups based on how many of the calories came from protein. The scientists found that the more protein a person consumed, the more IGF-1 was in his or her blood.5 Although the difference in the amount of IGF-1 among the three groups was small, it is important to note that even a small increase or decrease in hormones can considerably impact how the body functions, potentially causing it to react with acne outbreaks. 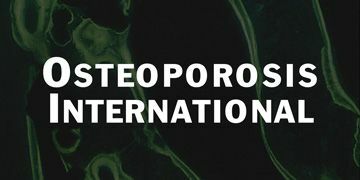 Additional evidence that a high-protein diet increases IGF-1 levels comes from an article published in 1997 in the journal Osteoporosis International, which shows that when people take in less protein, their IGF-1 levels drop. So, once again we can infer that the opposite would be true, that more protein would lead to increased IGF-1 levels. This article summarizes many older studies on low-protein diets, which showed that when a person begins to take in less protein, the amount of IGF-1 in his blood falls.6 From this, we can infer that starting to consume more protein, for example, by drinking protein shakes, might increase a person's IGF-1 levels. This may worsen acne but is mere conjecture at this point and is not borne out by actual data. So, It is hypothetically possible that a high-protein diet increases IGF-1 levels, and this could start a hormonal cascade that could hypothetically increase acne, but because this evidence is indirect, and only shows us about how protein can affect one particular hormone in the body, we should proceed with caution and not draw any conclusions until more rigorous research is performed. Next, let's look at the milk proteins that are often found in protein shakes, whey and casein protein, and see if we can uncover any more evidence. Can Milk Proteins like Whey and Casein Cause Acne? None of the studies we have discussed so far directly looked at how protein shakes themselves affect acne. Instead, they answered the question indirectly by giving us evidence on how a high-calorie diet or a high-protein diet affect hormones, which in turn might influence acne. But what about the most popular proteins found in protein shakes? Scientists have also explored how the two specific protein supplements often found in protein shakes, whey and casein, affect hormones. Both whey and casein are protein components of cow's milk: whey makes up about 20% of the protein in cow's milk, and casein comprises the remaining 80%.7 Based on the evidence specific to these two types of milk proteins, the jury is still out on whether they can affect hormones, but let's dig deeper to see what we can discern. Can Whey Protein Cause Acne? Whey protein is the most popular protein supplements taken by athletes, and usually come in one of two forms. Small, initial studies on whey protein seem to point toward a potential increase in insulin, and perhaps an increase in acne. 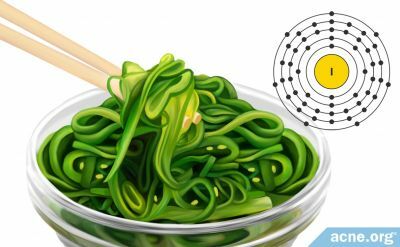 However, none of the studies controlled for calorie intake, so we cannot say for sure whether the results are from the protein itself or from an increase in calories. 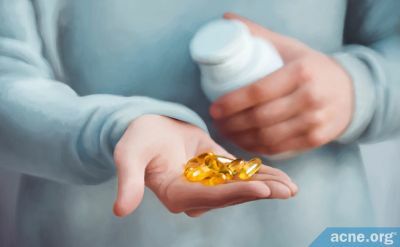 For example, during an experiment described in 2011 in the journal Nestle Nutrition Workshop Series: Paediatric Programme, 57 eight-year-old boys were given protein for seven consecutive days. The researchers found that consuming whey increased the amount of insulin in the boys' blood. The authors of the article wrote, "In the whey group…insulin increased by 21%. "7 As we have seen, it is possible that an increase in insulin may worsen acne. However, since this study was conducted on eight-year-old boys, who do not typically suffer from acne, it is difficult to draw any conclusions about the effect of whey on acne. Can Casein Protein Cause Acne? Casein protein is less popular than whey, but some supplements do contain casein protein. Plus, the more we learn about the various types of proteins, the more we might be able to generalize and make some conclusions on whether protein in general might lead to more acne. In one small experiment, researchers found that consuming casein tended to increase the amount of IGF-1 in the blood of 8-year-old boys. 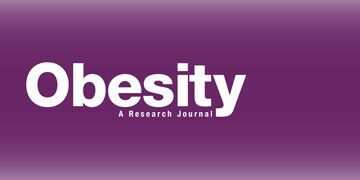 The authors of the article wrote, "In the casein group…IGF-1 increased by 15%, whereas there was no change in… insulin. "7 Because we have only this one small study performed on children, this is only a tiny additional clue. 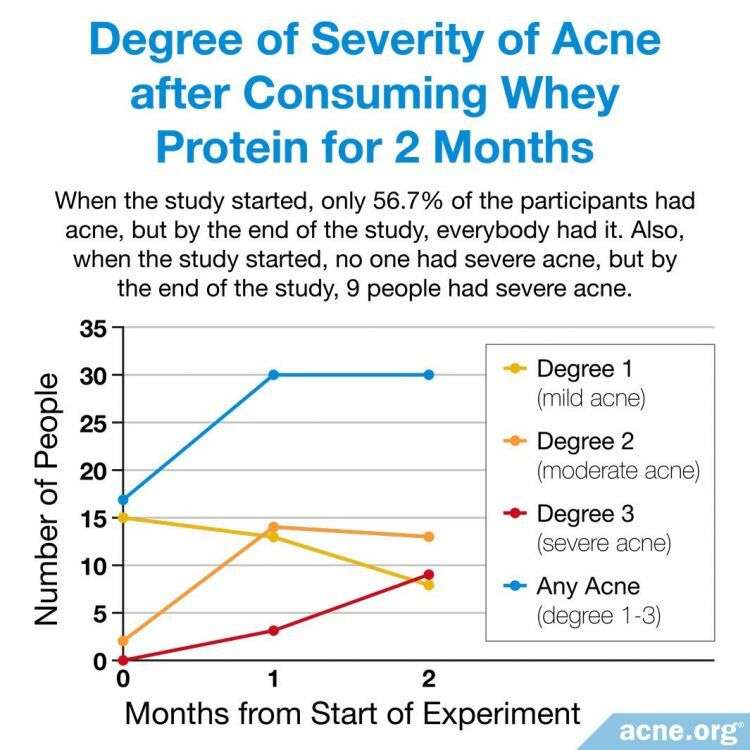 Summing up the results of the studies on whey and casein, we do not have enough evidence to conclude that they cause acne. Although some preliminary evidence suggests that whey and casein increase the levels of insulin and IGF-1 in certain people, which could hypothetically lead to acne, there is no reliable direct evidence that this occurs. In other words, don't be afraid of whey or casein protein at this time. We will need to see more research before we put them on any kind of "do not eat" list. What about "Weight Gainer" Shakes? Can They Cause Acne? Weight gainers, as their name implies, contain lots of calories, and as we have already discussed, increased calories may lead to more acne. But there is one other potential concern when it comes to weight gainer shakes. They often contain large amounts of sugar as well, and some studies have shown that high sugar diets may increase acne. People who consume protein shakes are usually on high-calorie diets. Research suggests that high-calorie diets increase the amounts of the hormones insulin and IGF-1 in the blood, which might lead to more acne. Eating food that is high in protein may also increase IGF-1 levels. Additionally, protein shakes often contain milk proteins, but there is not enough evidence to say that they contribute to acne. Taken together, there is some evidence that protein shakes trigger acne formation, but this is probably due to their high-calorie content. Weight gainers are usually high in calories and also high in sugar. For this reason, high-sugar weight gainers might pack more of a punch when it comes to acne development. However, this remains speculative until more research comes in. Pasiakos, M. et al. 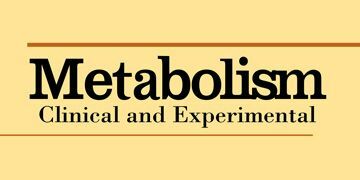 Appetite and endocrine regulators of energy balance after 2 days of energy restriction: insulin, leptine, ghrelin, and DHEA-S. Obesity 19, 1124 - 1130 (2011). Henning, P. et al. Effects of acute caloric restriction compared to caloric balance on the temporal response of the IGF-1 system. Metabolism 62, 179 - 187 (2013). Agamia, N. et al. 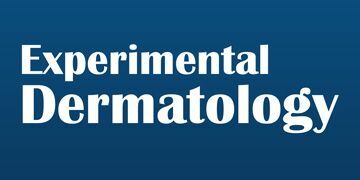 Skin expression of mammalian target of rapamycin and forkhead box transcription factor O1, and serum insulin-like growth factor-1 in patients with acne vulgaris and their relationship with diet. Br J Dermatol 174, 1299 - 1307 (2016). Melnik, B. Western diet-induced imbalances of FoxO1 and mTORC1 signalling promote the sebofollicular inflammasomopathy acne vulgaris. Exp Dermatol 25, 103 - 104 (2016). Levine, M. et al. Low protein intake is associated with a major reduction in IGF-1, cancer, and overall mortality in the 65 and younger but not older population. Cell Metab 19, 407 - 4017 (2014). Bonjour, J. et al. Protein intake, IGF-1 and osteoporosis. Osteoporos Int 7, 36 - 42 (1997). Clemens, R. et al. Milk and milk products in human nutrition. 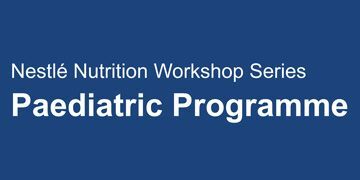 Nestlé Nutr Inst Workshop Ser Pediatr Program 67, 131 - 145 (2011). Burris, J. et al. Relationships of self-reported dietary factors and perceived acne severity in a cohort of New York young adults. 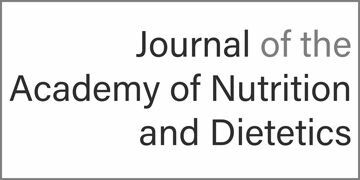 J Acad Nutr Diet 114, 384 - 392 (2014). Carvahlo Pontes, T. et al. 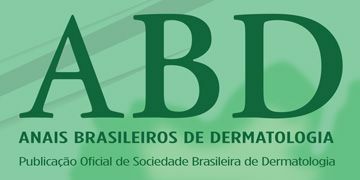 Incidence of acne vulgaris in young adult users of protein-calorie supplements in the city of João Pessoa - PB*. An Bras Dermatol 88, 907 - 912 (2013). Burris, J. et al. Acne: the role of medical nutrition therapy. J Acad Nutr Diet 113, 416 - 430 (2013). Zaenglein, A. L. et al. 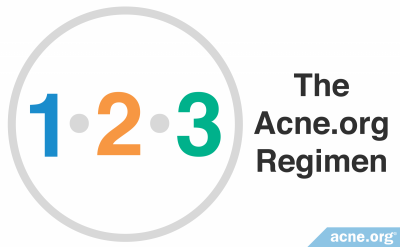 Guidelines of care for the management of acne vulgaris. 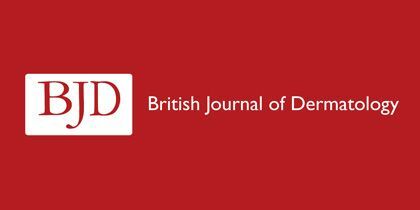 J Am Acad Dermatol 74, 945 - 973 (2016). Is There a Link Between Iodine and Acne?